Solid Color Rainsuit Storage Bag Buy Now! No rainsuit would be complete and portable without a matching solid color rainsuit storage bag. Roomy bag, offers plenty of room to store your rainsuit for easy access anytime. Keep your rainsuit in your car or truck - carry it anywhere and everywhere, just in case you need your durable lightweight rainsuit or jacket. 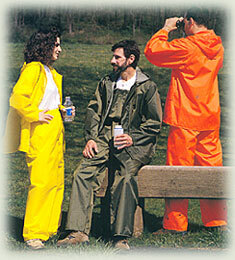 Don't get caught in the rain without the lightweight comfort and protection of your rainsuit. Order your solid color storage bag today to make your rainsuit and other accessories portable and convenient to reach.